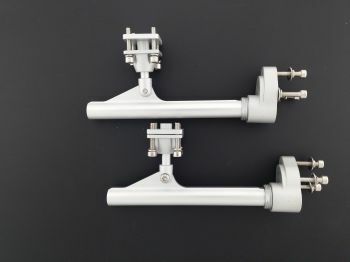 Twin strut set for 30"- 38" (750mm - 950mm) catamaran. Aluminum, CNC cut. Set of two struts for a twin motor/engine setup. Requires a catamaran with transom overhang. Strut 110mm (4.3") in length. Transom mounting plate 33mm tall x 20mm wide. Transom overhang mounting plate size 20mm by 20mm. Lead teflon bushing for 3/16" (.187", 4.75mm) propeller shaft.